Have you heard about the Wednesday Honors luncheons? The Wednesday Luncheon Series takes place almost every Wednesday of the academic year. In addition to food and refreshments, we serve up interesting lecturers, who hold court on art, science, music, history, religion, and more. Last week, we hosted Meet Your Honors Program, where students had the opportunity to discuss any questions you might have about the Honors Program with the program director, Dr. Gabriel Cwilich, as well as members from the Honors Student Council. This week, the Wednesday Luncheon asks: Interested in Postgraduate Fellowships and Scholarships? We’re hosting Dr Norman Adler, University Professor of Psychology, and Special Assistant to the Provost for Curriculum Development, Research Initiatives, and Graduate Fellowships. 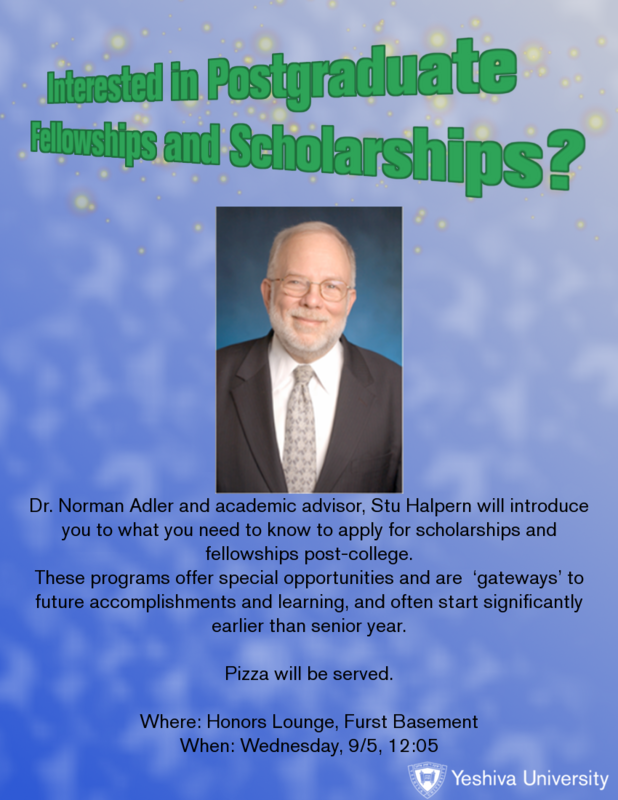 He and Stu Halpern, Assistant Director of Student Programming and Community Outreach, and Revel Coordinator of the Azrieli-Revel Dual Degree program, will discuss their roles as university fellowship coordinators. All students interested in continuing their education after college are strongly encouraged to attend. For more information, visit the university webpage on Fellowships & Scholarships.